Cleaners, caterers, porters and security staff at Liverpool Women's Hospital have won a fight for pay rises after striking. 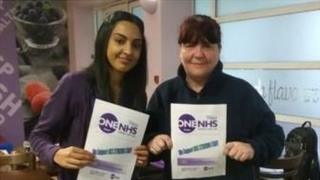 Unison said they will get a rise worth more than £1 an hour after three recent strikes to secure NHS wage rates. They will also get the same payments as their colleagues for working anti-social hours, overtime and weekends. The pay increase is to be jointly funded by private contractor OCS and the local NHS trust, the union said. Maria Moss, Unison's North West regional organiser, said: "Justice had been done at last. "All hospital workers are part of the NHS team and they should all be recognised for the important work they do." She said it was "unfortunate that our members had to resort to strike action to get treated fairly". "We hope that other privateers working in the NHS sit up and take note of what has happened." More than 40 staff members employed by OCS walked out in February. At the time the union said OCS paid some staff the national minimum wage of £7.83 per hour rather than the £8.93 NHS minimum.